2 Bedroom Flat For Sale in Whyteleafe for Asking Price £415,000. 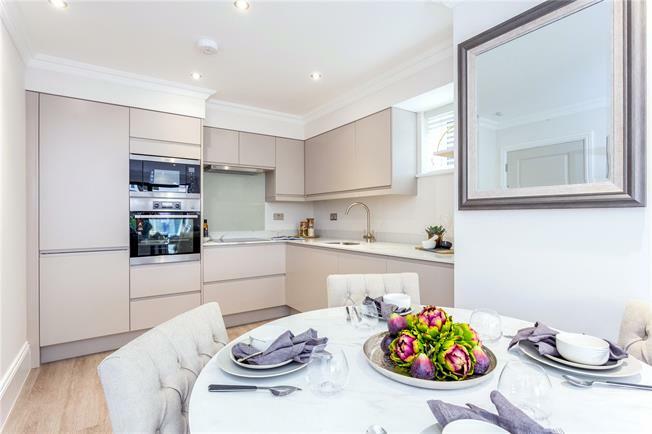 This brand new two bedroom apartment has been individually designed with a luxuriously appointed, open plan kitchen, living and dining room at it’s heart. The kitchen is British made with a full range of AEG integrated appliances, a 20mm Quartz worktop and concealed LED lighting under the wall cabinets. The modern bath and shower rooms have designer sanitary and brassware and are fitted with vanity units with ample storage and porcelain tiling to the floors and wet areas. Other features include under floor heating throughout (wet system), carpets to the bedrooms and a RING video doorbell system. The interior brings together traditional looks and finishes with a range of quality fixtures and fittings, all you need, in fact, to move in and start feeling at home immediately. Located only 0.1 miles from Upper Warlingham station, this luxurious apartment is ideal for the commuter offering an escape from the hustle and bustle of city life with numerous parks and green spaces on the doorstep, but being under half an hour to London Victoria. Whyteleafe offers unrivalled transport access for the area, plus restaurants, a micro-brewery and convenience stores, whilst just up at the top of the hill, Warlingham village green offers a vibrant mix of restaurants, boutique independent shops and an abundance of recreational facilities within the area. Each apartment has its own private amenity space.